A 100% British and Irish beef burger with cheese, Beechwood smoked bacon, a cheese sauce, seasoned grilled onions, tomato ketchup and lettuce, all in a toasted bun. 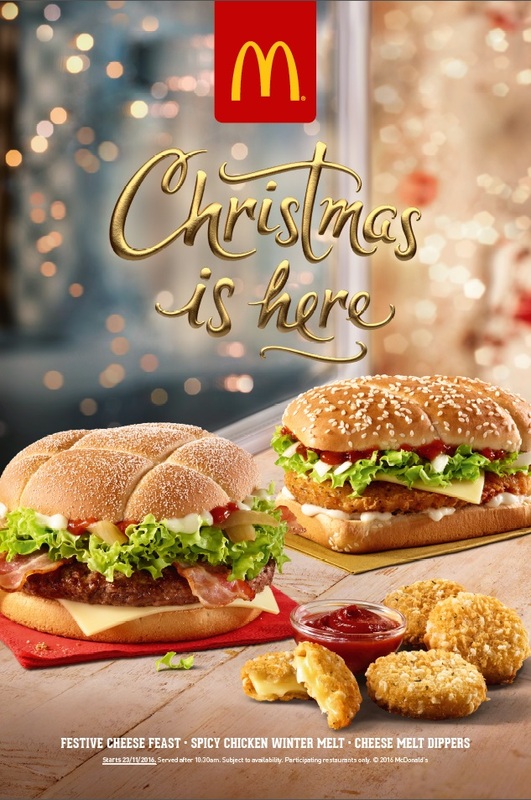 The McDonald’s Festive Cheese Feast is this year’s Christmas offering from Ronald and friends. It is essentially a bacon cheeseburger with added cheese sauce. So the “cheese feast” aspect is amply covered. We will leave the ramblings as to whether or not this is “festive” enough to others while we focus on the job in hand – a comprehensive and impartial review of the burger. The Festive Cheese Feast is joined in the 2016 Christmas line-up by the popular and returning Spicy Chicken Winter Melt, which we have reviewed before. 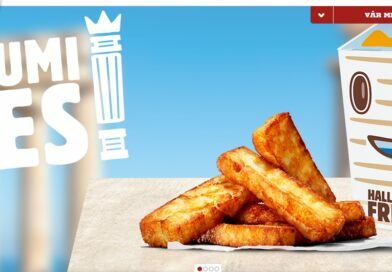 In addition, there is a special McFlurry, a Banoffee pie and Camembert cheese bites – all announced to us on this website in an another exclusive! It looks good in the promo shots and I admit to being rather fond of cheese, so the double whammy of cheese and extra cheese sauce appeals to me greatly. I was there at 10:30am on the dot. The menus had just been switched from breakfast and I headed straight for the self-order screen. 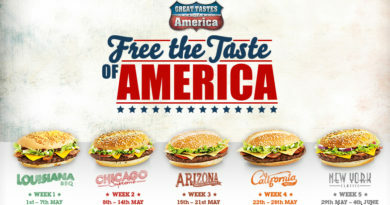 Those, along with the table service, really do add to the appeal of McDonald’s. My receipt was printed out and I sat in one of the three coloured zones waiting for my burger. At this point i noticed that my Festive Cheese Feast was described by the POS as “cheesy beef”, which I suppose is technically correct although it could apply to most menu items. Granted, the restaurant wasn’t terribly busy when I was in, but my order did come out lickety-split, table service with a smile, and in a smart-looking red and orange promo box, which even before opening, gave the impression of something large. Opening it up, I could see it was big, wide certainly. This was the larger sized patty McDonald’s uses on the Big Tasty I believe. 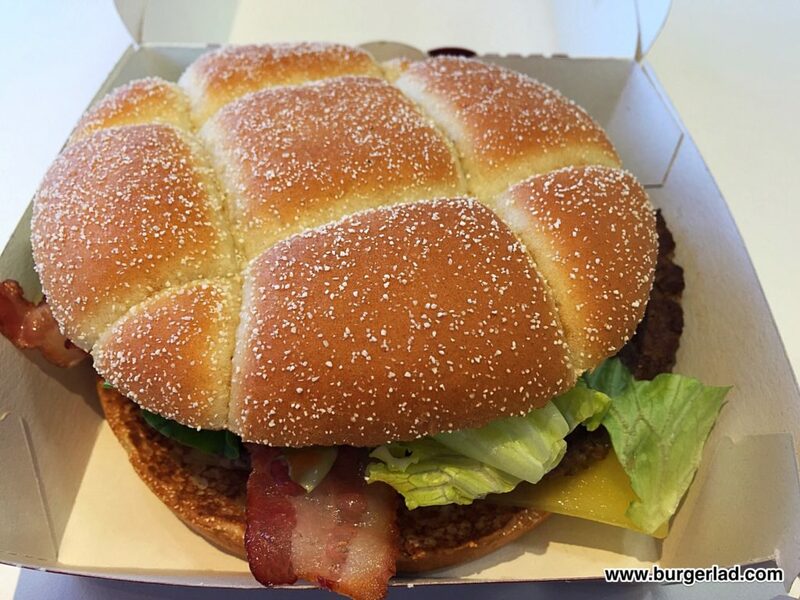 But despite the girth, it did seem a little flatter than the promo pics would suggest – now, this shouldn’t affect the taste, and the aesthetics were rather taken care of by the patterned bun which I did find appealing. A pretty impressive special I thought, before even picking it up, and an opinion reinforced by the enjoyment of eating it. I inspected the build and am still undecided if this was the correct cheese or not. The very white cheese sauce initially scared me into thinking it was mayo, until I checked our exclusive preview, and noted the cheese sauce was apparently supposed to be white. I returned to my eating, confident that the Festive Cheese Feast does in fact have cheese sauce! The burger also includes onions, which I must say are always pleasant to find. These particular ones are grilled rather than crispy, and I felt that the soft gooey texture worked perfectly with the cheese sauce, giving a wonderful fluffy, floaty sensation, just like Santa skipping through the clouds on Christmas night. Bacon was also present, as were the aforementioned cheese and lettuce. In fact, this was a VERY good build – it had been put together with obvious care and attention to instructions and just like the promos, I could make out all the ingredients without having to lift the lid. It was also quite likely the very first one this branch had sold. Flavour-wise, this was all about the subtlety, a harmony of ingredients working well with each other, with no single item stealing the show. Teamwork, just like the elves and the reindeer. Even the cheese sauce was subtle. We have definitely seen LTOs in the past with cheese overload, which clearly isn’t everyone’s cup of tea, but not here. This was very well executed, and as a result, extremely enjoyable. 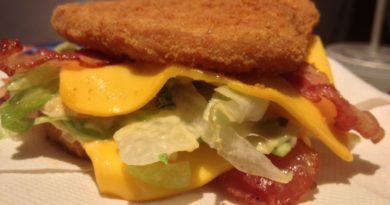 Perhaps because of the ketchup and cheese sauce on the top, the slice of cheese was pushed to the bottom. Ordinarily not my preference, but biting down to that last, after getting my teeth through the other items kind of worked on this. I actually liked having the cheese and cheese sauce separated like this, rather than merging together. Finally, the inclusion of cheese sauce negated to a degree the fact that the cheese slice wasn’t melted but this is standard when ordering at this time of day. And the smoked bacon was done really well too. No limp morsels here, this burger had two rashers proudly protruding from the bun and their slightly smoky flavour, picked out in the eating, enhanced the overall appeal. The onions and lettuce were presented immaculately as well, with the latter adding considerable visual appeal. As I said above, the cheese sauce and onions together created that lovely pillowy softness which I reckon is the standout feature of this burger. 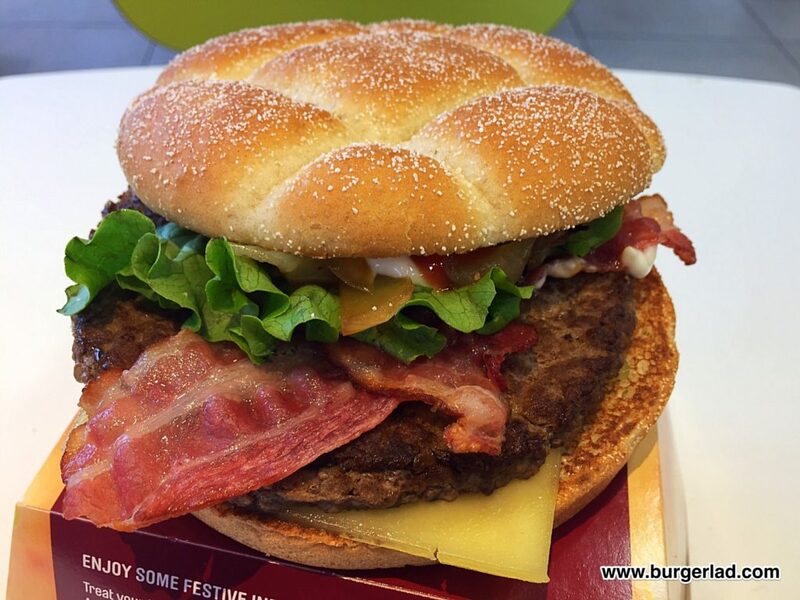 Now, we must briefly address the reindeer in the room as it’s bound to come up on social media… There isn’t really anything particularly Christmassy about this burger, besides the name and possibly the bun, but let me spell it out – it doesn’t matter! 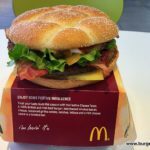 Leave the towering Christmas-dinner-in-a-bun extravaganzas to the gourmet places, this burger is McDonald’s at its best – a good-looking tasty special that will appeal to almost everyone without breaking banks or waistlines. Sure, it probably isn’t the all-time best McDonald’s special but I’m going to rank it fairly highly. 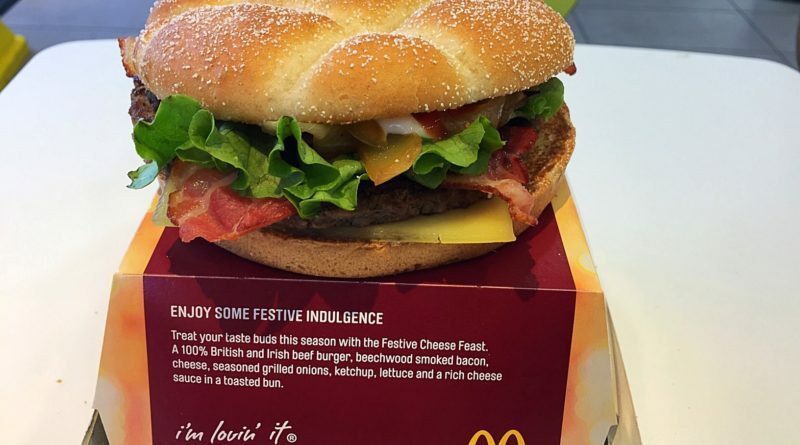 Simplicity and faultless development and execution, the McDonald’s Festive Cheese Feast is available now and remember folks, you read about it here first. 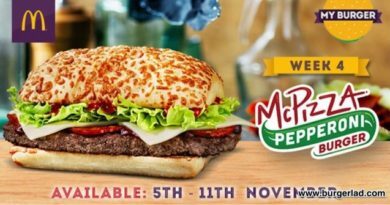 It is that time of year again when McDonald’s release their Festive Menu! With a massive thank you to our “secret sauce”, we are able to reveal the full details of the McDonald’s Festive Menu before anyone else! 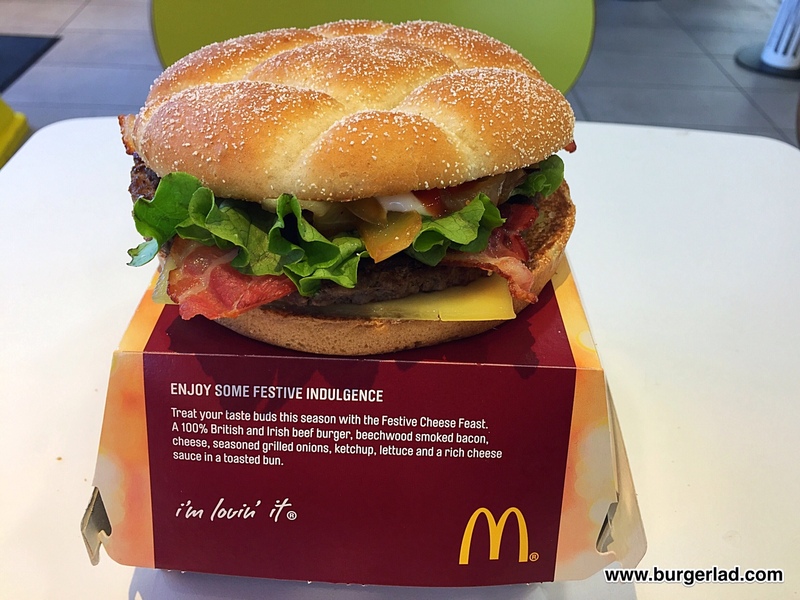 Up first for 2016, is the new Festive Cheese Feast and is described as “a 100% British and Irish beef burger with cheese, Beechwood smoked bacon, a cheese sauce, seasoned grilled onions, tomato ketchup and lettuce, all in a toasted bun”. Returning from last year is the Spicy Chicken Winter Melt – a “succulent chicken breast fillet in a crispy coating with an Emmental cheese slice, fire roasted red pepper sauce, slivered onions, a cool mayo and lettuce”. The McDonald’s Festive Menu for 2016 is finished with a Terry’s Chocolate Orange McFlurry and Chocolatey Banoffee Pie. The interesting sounding pie is “a hot crispy pie filled with thick Banoffee and Chocolatey sauce”. 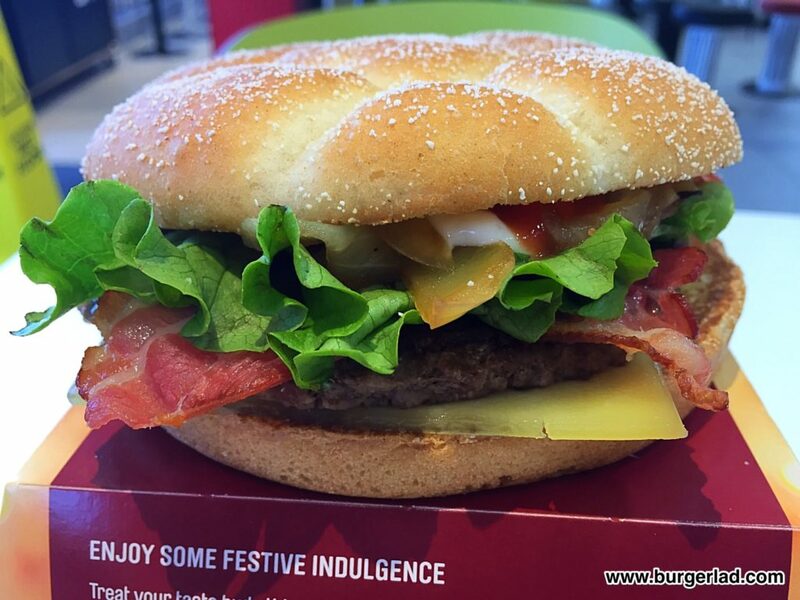 So there you have it – the McDonald’s Festive Menu for 2016! What do you think of the line-up? Is there anything you particularly want to try? What are your thoughts on the beef option and the returning Spicy Chicken Winter Melt? 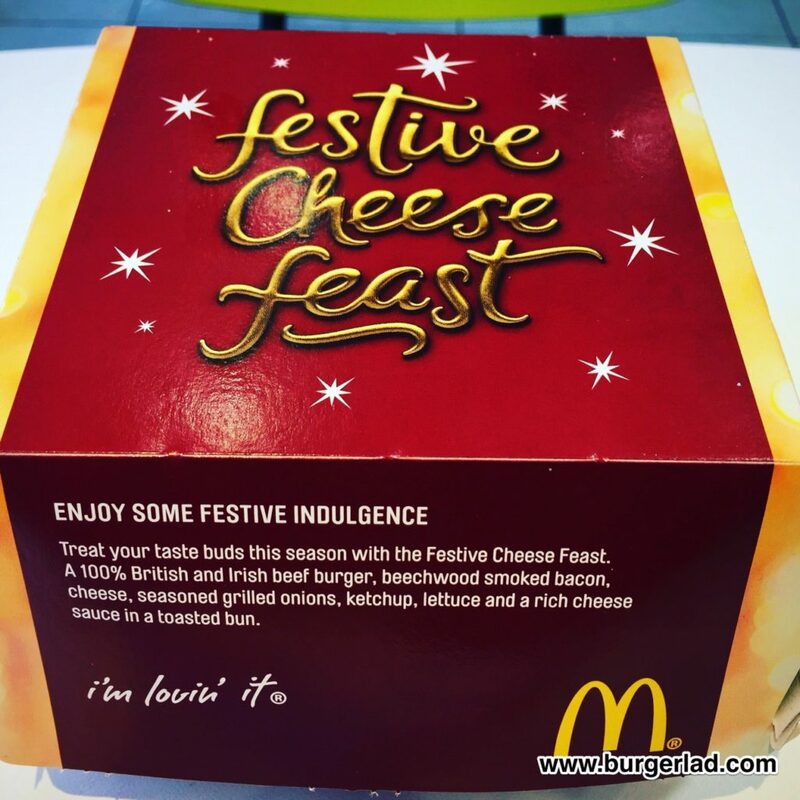 We will have a review of the new Festive Cheese Feast for you when the menu launches at McDonald’s on Wednesday 23rd November. Remember… you heard it here first! Huge mistake McD’s – your chocolate and banoffee pies are disgusting, as was the chocolate orange one a few years ago. I know they like to be seen to change their menu around a bit, but the mincemeat and custard festive pies are the only decent flavour they’ve done in years. No trips there for me this winter.